The rare and highly sought after (at least by me!) 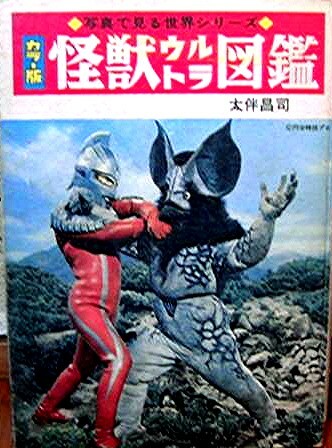 Ultra Kaiju Picture Book…which I don’t have btw 😦 was published just months before the end of Ultra Seven’s popular run on TBS Japan in 1968. 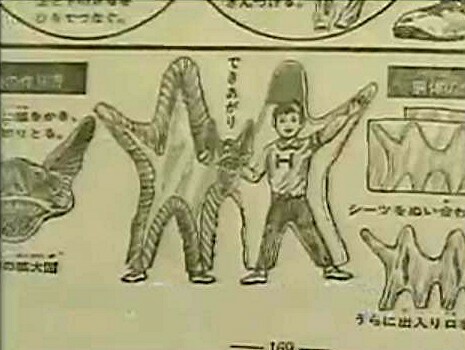 The book features images and descriptions of monsters from the early original Tsuburaya tokusatsu programs (1966-68) …Ultra Q, Ultraman, & Ultra Seven…and of course as you saw in the video…instructions to make your own homemade costumes…now that’s fun! I love how you need two people for the Pestar suit! 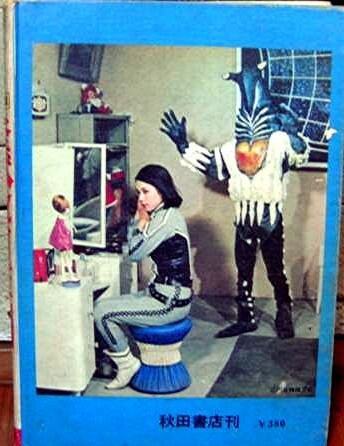 Well, I don’t think I’ll be getting this book anytime soon…it can be found at online auctions occasionally but the book usually fetches btwn $200-$300! A bit high for me right now. So, if anyone out there has one to scan and share… that would be great! Some amazing vintage plastic model box art by famed Japanese artist Shigeru Komatsuzaki. Shigeru Komatsuzaki (1915-2001), a prolific illustration artist for over 50 years, is responsible for bringing us original artwork used for the Thunderbird series, Nitto Gamera and Gappa series, the Mirrorman series, Dinosaur series and the exacting Military series of plastic model box artwork. 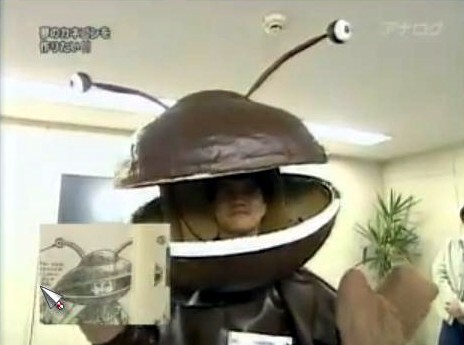 For collectors, Mr. Komatsuzaki’s artwork is sought after and highly prized. Having produced over a thousand original pieces of artwork in his career, Shigeru Komatsuzaki originals are extremely rare, as most of the original paintings used on the beautiful model boxes is gone forever…sadly destroyed in a massive fire. 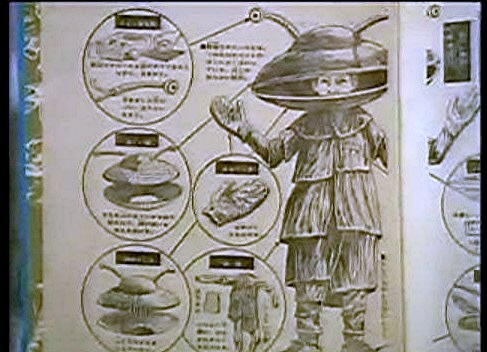 Komatsuzaki also supplied some of the character design for TOHO’s 1959 film The Mysterians. He is also given film credits for his wonderful conceptual and costume design for the 1963 film Matango and 1965’s Atragon. I just love the kaiju artwork on these! 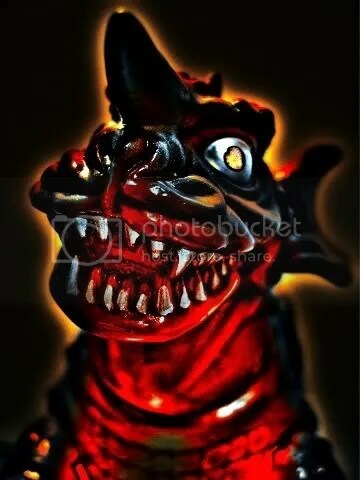 I just saw Frankenstein vs Baragon again…it inspired me to complete a second Baragon for the Kaiju Art Collection. I actually don’t have a ‘Frankenstein’ vinyl…I gotta get on that! I used the Marmit 2005 Para-Baby crawling version for the photograph. 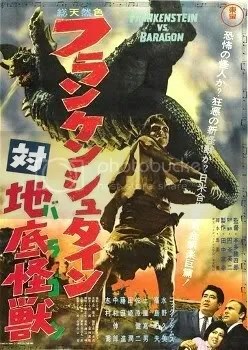 Baragon makes his fearsome debut in 1965’s Frankenstein vs Baragon. The film, a homage of sorts, to the original Mary Shelley’s Frankenstein, takes the monster to new heights… literally. This tokusatsu film see our ‘Frankenstein’ monster man grow to titanic heights. The movie tells the story much in the same way as Shelley’s masterpiece… the kind-hearted monster is created under ominous circumstances, he is wrongly blamed for the horrible misdeeds of another, and finally he is persecuted by a fearful community. Baragon plays the part of the antagonist in the film. An unthinking beast that attacks without compunction, Baragon attacks tiny hamlets and then vanishes by burrowing into the Earth. ‘Frankenstein’ is hip to the beasts wrongdoings and eventually the film’s title will come into play. Having discovered that Baragon is truly responsible for the devastation…the finger-pointing human race now depends on their ‘monster’ to save them. This is a fun 1960’s monster movie with spectacular effects…don’t miss it! Godzilla, Mothra, and King Ghidorah…All monsters Attack! That’s what happened to the castaways in 1963’s Matango! 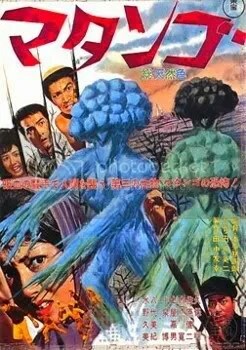 Matango, also known as Attack of the Mushroom People, is directed by Ishiro Honda, with SFX provided by, the oft mentioned here, Eiji Tsuburaya. The fungus fueled film tells the story of a group of wealthy castaways who find themselves stranded on a tropical Pacific Island after their luxury yacht wrecks due to a storm. The castaways soon find remnants of a previous shipwreck…but no survivors. Though it is apparent that the previous survivors were able to stay alive for some time… what happened to them???? Succumbing to starvation, the pitiful castaways are reduced to eating the native mushrooms… not heeding the warning of their own yacht Captain… and a warning of ingesting the shrooms found on the previous wreck’s logbook. The film descends into psychedelic imagery, and psilocybin induced paranoia, as the castaways come to terms with the discovery of the fate of the former castaways… and glimpse their own. A darker film for the era, Matango is a study of the dangers of our human excesses and disrespect of nature…a nature that will ultimately and defiantly return the human race to it primordial origins. Of course I highly recommend this film! Exciting direction, SFX, and imagery…and yeah…Mushroom Monsters! 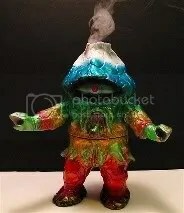 For the Kaiju Art Collection ‘Matango’, I used the M1-Go, Hawaiian colorway figure. Here’s a little video thingy I made set to music! If you’ve never seen Ultra Q (the FIRST X-Files), this video will hopefully introduce you to the look and feel of the show. I was really surprised to find a lack of Ultra Q on youtube! 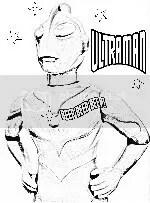 EDIT: Well… Tsuburaya Productions didn’t like my little music video and it got taken down…sorry. Unfortunately the series has yet to be subtitled or dubbed for release in the U.S…. to my knowledge. The ingenious Ultra Q was created by Eiji Tsuburaya and had a run of 28 episodes in 1966. I wish I could just start uploading episodes… but that would probably get me in trouble. 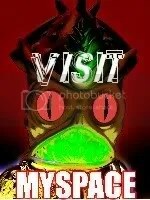 Click the Ultra Q logo to visit the gallery and look at some monsters! 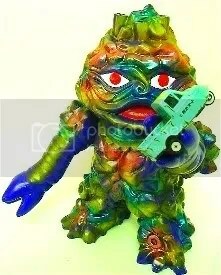 The garbage monster sculpt, originally created by I-K-B toys in 1971, has proven to be a very popular kaiju with vinyl collectors. Smogun’s popularity is due in part to the character’s mysterious origins, it’s rarity, and the devoted re-issues by Gargamel and Hukkokudo. With a torso made of tires, cars for feet, a truck for a head, and headlights for eyes, Smogun is a very unique Kaiju…and that’s saying a lot with all of the imaginative creatures out there! 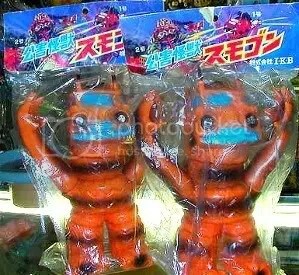 For those of you new to collecting vinyl… most Japanese vintage, and new vinyl toys are sold packaged in a clear plastic bag with a stapled header card. 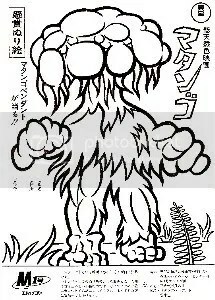 The header usually features original printed artwork of the enclosed Kaiju. 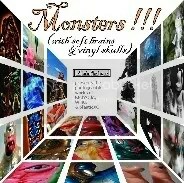 The artwork, either commissioned or painted by the vinyl toy creator, commonly features the monster/hero in some sort of battle scenario with other monsters, probably related creatures in a series that are also available to purchase. 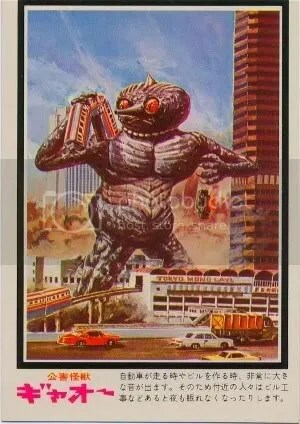 The header art usually features very stylized text, exciting action, and vivid, eye catching colors… I’ve actually bought kaiju just for the cool header card alone! See my Salary Ika Post. In the case of Smogun, the I-K-B header card plays an important role. 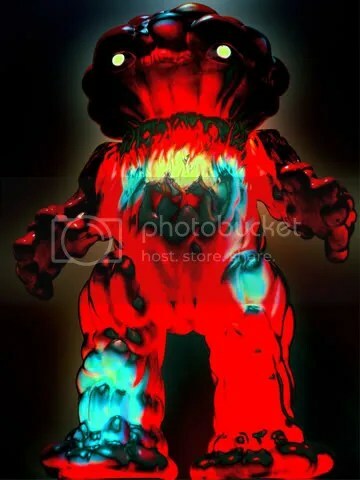 The refuse monster, having no TV program or manga to encourage it’s sale, the toy depends entirely on the creativity of the sculpt and an interesting header to grab your attention…and your wallet. 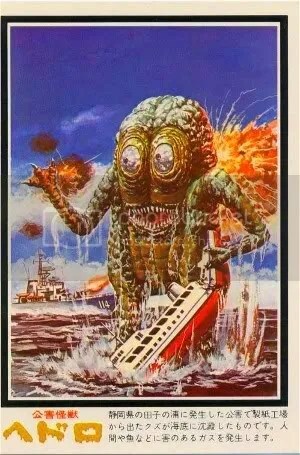 Smogun’s header features said Kaiju battling it out with another fictional monster named ‘Mosugun’ aka ‘Smogun 2’. If the ‘Bemon’ character was ever produced in vinyl in the 70’s… it’s existence remains unknown…except for the one I have…but you can’t see it…it’s the only one…only I can look at it! On a side note: ‘Bemon’ or ‘Mosugun’ from the I-K-B header is also released as ‘Smogun2’ by Target Earth Toys. 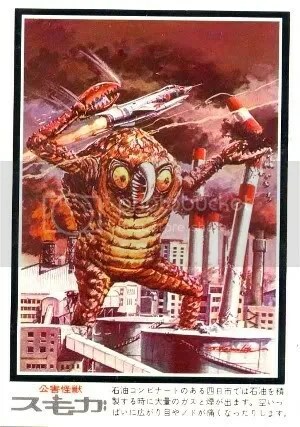 On the flip side of the Smogun header are pictured various ‘pollution monsters’ called ‘Hedorans’ , which bear an uncanny resemblance to TOHO’s Hedorah the smog monster. Hedoran has also been widely re-released by Gargamel. 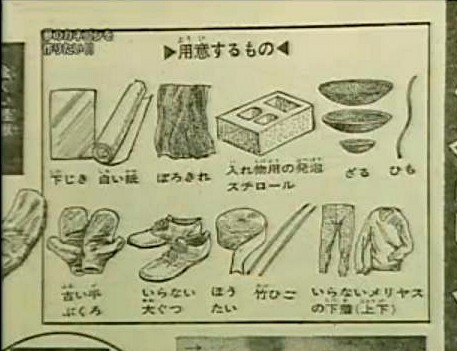 As far as I-K-B Toy’s history…it remains a complete mystery to me . 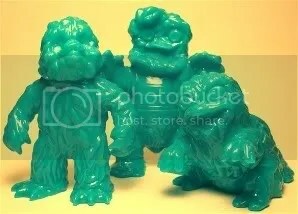 I have been unable to find any more information on the elusive vintage toy company…so hit me up if you’re in the know! With a little digging, you’ll unearth quite a few customs and colorways of Smogun. It’s also found in standard and mini sizes. 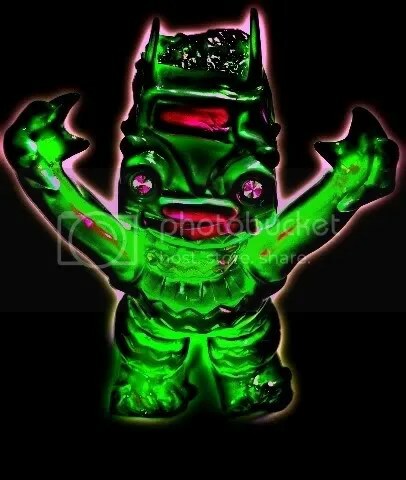 For the Kaiju Art Collection Smogun at the top of the post …I used the Hukkokudo full size repro of the original I-K-B 1971 colorway. I liked the color interplay of green opposed to the original orange. See it supersized in the gallery!